The planned Ukrainian-Russian strategic cooperation agreement that would involve Ukraine's joining the Customs Union of Russia, Belarus and Kazakhstan and has triggered mass protests in Ukraine is due to be signed on December 17, a Ukrainian opposition leader claimed on Saturday. "According to our information, [Ukrainian President Viktor Yanukovych] plans to sign it on December 17," Arseniy Yatseniuk, parliamentary leader of the Batkivschyna (Fatherland) party, told a briefing at the "National Resistance Headquarters" in Kyiv. 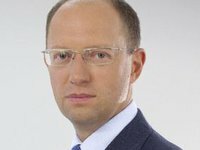 However, Ukraine's parliament is unlikely to ratify the agreement, according to Yatseniuk. "Any agreement to build a new Soviet Union means splitting up the country. And that would mean a totally different Maidan [Independence Square in Kyiv, a name used as a synonym for Ukrainian protest movements] from what we are having today," he said. Earlier, Kremlin spokesman Dmitry Peskov said Yanukovych and Russian President Vladimir Putin, at a meeting in Sochi, Russia, on Friday, discussed the agenda for a planned meeting in Moscow on December 17 of the Russian-Ukrainian intergovernmental commission. However, Peskov denied that the two leaders had discussed Ukraine's proposed accession to the Customs Union.